CSUN’s Armer Theatre hosts a screening of the documentary “7 Days in Syria” at 7 p.m. on Friday May 5. When a rebel-held Syrian town was bombed with chemical weapons on April 4 — killing 72 civilians, including 20 children — the Syrian civil war returned to the international media spotlight. The United States and several other nations alleged that Syria’s own government carried out the bombing. Three days later, President Donald Trump authorized a missile strike against Syria’s Shayrat Airbase in response to the chemical attack, further escalating international tensions in the area. Lost in the turmoil, however, are the millions of Syrian civilians whose lives have been upset, uprooted or cut short by the ongoing civil war that erupted there in 2011. 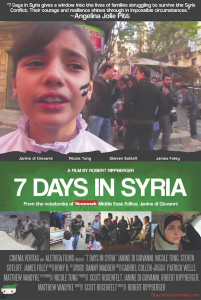 To illuminate Syria’s ongoing conflict, California State University, Northridge’s Cinematheque will screen the documentary 7 Days in Syria, at 7 p.m. on May 5, in the Armer Theatre. Robert Rippberger, the film’s director, will be in attendance. The documentary features renowned war correspondent Janine di Giovanni, Middle East Editor of Newsweek, who tried in vain to get a newspaper to send her to cover the Syrian uprisings in 2012. After every newspaper she approached rejected her request due to the dangerous situation on the ground in Syria, Di Giovanni traveled there on her own. “[While] 7 Days in Syria brings a firsthand view of what is happening in a country ravaged by a protracted civil war, it’s also about the courage of journalists in reporting the truth of what is happening,” said CSUN cinema and television arts professor María Elena de las Carreras, one of screening’s organizers. The Syrian war has killed more than 400,000 people and displaced more than 10 million — as refugees and inside the country. In 7 Days in Syria, Di Giovanni meets the Syrians who remain in their devastated homeland, trying to persevere in one of the Earth’s darkest places. After the film, Rippberger and CSUN experts from the Departments of Cinema and Television Arts, Journalism, and Middle Eastern and Islamic Studies will participate in a panel discussion, addressing current issues on the Syrian war and its subsequent humanitarian crisis. The screening is free and open to the public. For more information, please visit http://www.csun.edu/mike-curb-arts-media-communication/cinema-television-arts/events/7-days-syria.